OJ Simpson is looking to make a killing with his new book, "If I Did It," to be released Nov. 30. 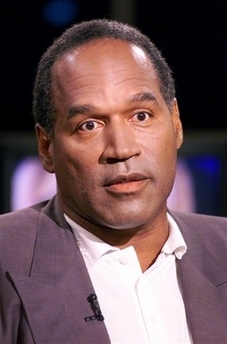 To promote the book, OJ sat down for an interview to discuss the book's topic: How he would have committed the 1994 slayings of his ex-wife, Nicole Brown Simpson, and her friend Ronald Goldman, "if he did it." Call it a publicity stunt. Call it a sick way to publicly confess to murder. The two-part interview will air on Fox Nov. 27 and 29 in a special titled "OJ Simpson: If I Did It, Here's How It Happened." According to Fox, "OJ Simpson, in his own words, tells for the first time how he would have committed the murders if he were the one responsible for the crimes." Will OJ have to wear black, bloody gloves and drive off in a white Bronco for the public to get the picture? OJ certainly needs the money. He has yet to pay any of the $33.5 million judgment against him from a 1997 civil case, according to the AP. Even if he's actually innocent, it's completely disturbing to go about writing an entire book dedicated to how you would kill your deceased wife. And yet, America will tune in and the man will get paid.